"Ernest Hemingway once wrote,'The world is a fine place and worth fighting for.' I agree with the second part." When looking back on the influential directors of the 1990's, David Fincher seems to stand above the crowd. Starting with the misunderstood Alien 3, Fincher brought his in-your-face style of filmmaking to the table, and the rest as they say is history. After Alien 3 disappointed both critics as well as most fans, Fincher returned with his first of two masterpieces in 1995's Seven. When looking back on the directors short career, Fight Club proves to be the better film, but it all started with Seven. Detective David Mills (Brad Pitt) is new on the job, William Somerset (Morgan Freeman) is in his last week on the job. Each has a different take on solving crime. Mills is rearing to make a difference, while Sommerset is more patient and methodical. The killer pursued by Mills and Somerset believes that the work he is doing is necessary, and that the mark he is leaving will actually help the cops and the citizens of the city. He is, perhaps, not too far off the mark... the murders are original and completely fitting for the sin he is seeking attrition for. For instance, the sin of "Gluttony" leads the killer force a man to eat himself nearly to death at gunpoint. What makes Seven stand out among the countless other serial killer films is that it is much smarter. As the killer gets further into his sermon the cops must get wiser, reading Dante and Chaucer among others to figure out the killers next move. When I first saw Seven in 1995 it stuck with me for days. I remember going with a friend to eat after the showing and I was as close to shaken up during the dinner as any movie could possibly make me. This is a film that hits hard, and it never apologizes for it. That is not to say that Seven is 120 minutes of non-stop action. Some of my favorite moments in the movie are the quiet ones. Somerset researching in a library while a beautiful piece of music plays in the background, or the talk with the killer where suddenly he is given as much voice in the film as the detectives. This is as close to a perfect film as you will find. 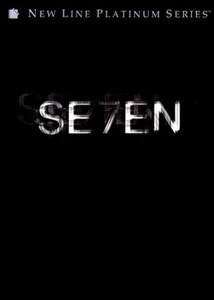 Seven is a film about mood and atmosphere. It rains most of the time, and the locations are dark and dreary. The crime scenes are lit with dim lights, and shadows are cast all around the place. The detectives' flashlights, which bounce around the room only light few places, illuminating key pieces to the plot of which Fincher wants you to see. In fact, a friend of mine calls Seven the greatest 1970's cop film ever made, and I am starting to think he is right. The use of dull colors in even the most exciting scenes make the film look like it belongs in another decade. Cinematographer Daruis Khondji, who was robbed of an Oscar® nomination for this film, does his best work of his career with this film. But Seven is essentially a David Fincher vehicle. It is very rare for a director to have made two masterpieces out of only four films, but Fincher has done it. Every step of the film works, from the deliberate pacing of the first hour-and-a-half to the tension filled final 30 minutes there is never a misstep. The cast is also uniformly excellent. Freeman was already known as a gifted actor, so a performance of this caliber was expected. But it is Pitt, who I believe came into his own in this film, that really surprises the viewer. Known primarily for his work in Legends Of The Fall it was with Seven that he started taking more complex and demanding roles. His Detective David Mills is not entirely likeable at the start of the film, and it is a true testament to Pitt that by the end we are completely on his side. Gwyneth Paltrow shows up in her first starring role, and does a fine job. Image Transfer Review: The original version of Seven from New Line was one of the first discs I bought when I got my player in 1997. It still ranks as one of the most watched discs in my collection, and I never thought that the transfer was all that bad. That was until I watched the new anamorphic 2.40:1 print used on this new special edition print. Sharpness and detail are perfect, and there is very little shimmer evident throughout the picture. Pixelization is never evident, and while there is some grain in the film, it is intentional. Colors are fine, as are the black levels. Blacks are especially worth mentioning because they have a deep look to them, unlike most transfers these days. This is a great transfer, and on par with other work by New Line. Audio Transfer Review: This new two disc special edition of Seven offers both a Dolby Digital EX as well as a DTS ES mix. Having heard the Dolby Digital version countless times on the first DVD of Seven I watched the film with the DTS ES mix. This isn't an overly showy mix, but it still ranks among the best I have ever heard. The real star is Howard Shore's score of the film. It creates an atmosphere that envelops the viewer and adds a much more haunting element to the film. The dialogue is clear and understandable, and the separation between the front speakers is well done. That is not to say that there aren't moments to show off your system. Sommerset's visit to the library in chapter 9 creates the best use of the extra rear speaker. Bach fills the room from every direction, making you feel as if in a concert hall. The Dolby Digital EX mix is a bit less powerful upon comparison, but it still gets the job done. Extras Review: Starting on December 19th I want you all to do me a favor. Take your movie only copy of Seven and throw it out the window. This disc is all you are going to need. Spread across two discs and featuring four commentary tracks this is THE definitive version of Seven. David Fincher, Brad Pitt, and Morgan Freeman: Essentially a track featuring Fincher and Pitt, Freeman does pop up from time to time and his comments are the best thing about the track. Anyone who has heard the actor/director track on Fight Club knows that both Pitt and Fincher has a great deal of chemistry, and it is evident here. There are a lot of behind- the-scenes stories, and it is a treat to listen to them bounce them off of each other. Richard Dyer, Screenwriter Andrew Kevin Walker, Director David Fincher, Editor Richard Francis-Bruce, and New Line president of production Michael DeLuca: Dyer hosts the track, while the remaining four offer their different takes on the film. Walker talks about his inspiration for writing the film, and his thoughts on the subject matter. Francis-Bruce discusses how difficult it was cutting the film, and creating a sense of tension. And New Line President Michael DeLuca and David Fincher talk about the studio's thoughts on the film, as well as the multiple drafts of the script. There is a lot of technical information as well as a nice history of the project here. Richard Dyer, David Fincher, Cinematographer Daruis Khondji, Editor Richard Francis-Bruce, and Production Designer Arthur Max: Much like the previous track this focuses on the making of the film, and while both Bruce and Fincher have contributed to other tracks on the disc, this is essentially a track for Darius Khondji. Khondji spends a lot of time talking about how he created the dark look for the film, as well as some of the creative camera angles used in the movie. Arthur Max discusses his production design, adding to an already informative track. Richard Dyer, David Fincher, Composer Howard Shore, and Sound Designer Ren Klyce: For the first time on three tracks, host Richard Dyer gives his thoughts on the film. Essentially how the sound in this movie helps to create mood and tension. Shore and Klyce also offer their thoughts on the sound mix and score. A nice unexpected treat is that the score plays in 5.1 sound when there is silence in the track. First up is the Exploration of the Opening Title Sequence. Available in multiple audio formats including Dolby Surround, Dolby Digital EX, DTS ES, commentary by sound designer Ren Klyce or commentary by audio engineers Brant Biles and Robert Margouleff. The angle button on your remote control lets you view the rough and original versions of the creepy opening credit sequence of Seven. Deleted scenes and extended takes: Features seven scenes that were either cut entirely from the film, or are different takes on existing scenes. There is also optional commentary by David Fincher. Among those takes are animated storyboards that show a never filmed train scene that was to have been the title sequence for the film. Another section contains the Alternate Endings. While the original ending of Seven is not that much different from the final cut, little changes make the tone of the final scene different. As previously shown on the Criterion laserdisc, an unfilmed ending is shown in storyboards. Each ending is also available with or without the director's commentary. Design Sketches: Nearly 9 minutes of design sketches are shown with running commentary by production designer Arthur Max. Still Photographs: In this section there are large amounts of photos, including John Doe's photographs. Those are available with commentary by photographer Melodie McDaniel. The stills documenting Victor's various stages of decomposition are included with commentary from Fincher. The police scene photographs are shown with a commentary from photographer Peter Sorel. Last in the still section are about 11 minutes worth of production photos, with more commentary by Sorel. The Notebooks in the film by John Doe are shown with commentary. Promotional Materials: The original 6-minute electronic press kit shows interviews with the cast and crew. The theatrical trailer is shown in a 2.35:1 ratio and Dolby 5.1 sound. Filmographies for the cast and much of the crew are also available. The best thing about this disc is the section titled Mastering For The Home Theater on the disc. Four sections are shown totaling nearly a half hour of material on the making of this DVD for Seven. Audio Mastering features Robert Margouleff and Brant Biles of Mi Casa Studios and the work they did to remaster the film. Video Mastering offers commentary by colorist Stephen Nakamura and New Line's vice president of video post production Evan Edelist. This shows differences between the technology used to originally transfer Seven to video, and the improvements made for this disc. Color Correction Demonstration is a 15-minute feature that shows a scene from the film being redone as you watch. All of this is put together in the Telecine Gallery where you'll be able to compare and contrast the old and new video masters and audio mixes. There are a few things that were left out of the original Criterion Collection laserdisc. Mainly the deleted artwork from the disc including title treatments and poster designs. I will say it now, this is the disc of the year. Forget Fight Club or The Ultimate Toy Box, this is the disc to get. Seven is a great film, and the disc only enhances that fact. With the great video and audio transfer, as well as the plethora of extra features that are located on each disc, this is impossible not to pass up. Highly Recommended.